By Zack Quaintance — Oh hey, would you look at that? We got the date for this piece right! Though, we’d be lying if we said it wasn’t a challenge. Basically, the New Year has arrived folks! Bringing with it those always-confusing date problems that take place in writer’s heads before we’ve fully adjusted. Last week’s post-Christmas crop of comics was pretty barren (although it wasn’t without some great titles). This week’s bunch is a bit better, at least in terms of volume. What’s also great is that some of our favorite series from 2018—namely Action Comics and Immortal Hulk—have new installments! Pair that with the start of Jason Aaron’s highly-anticipated run of Conan the Barbarian, and hey, maybe this year will be starting off special. All that said, let’s take a closer look! The Red Cloud sets her sights on someone close to Superman, but how can the Man of Steel stop a villain he can't touch? As the invisible mafia controlling Metropolis' underworld steps more into the light, its leader finally stands revealed with a secret that will have massive implications for Superman and Clark Kent! 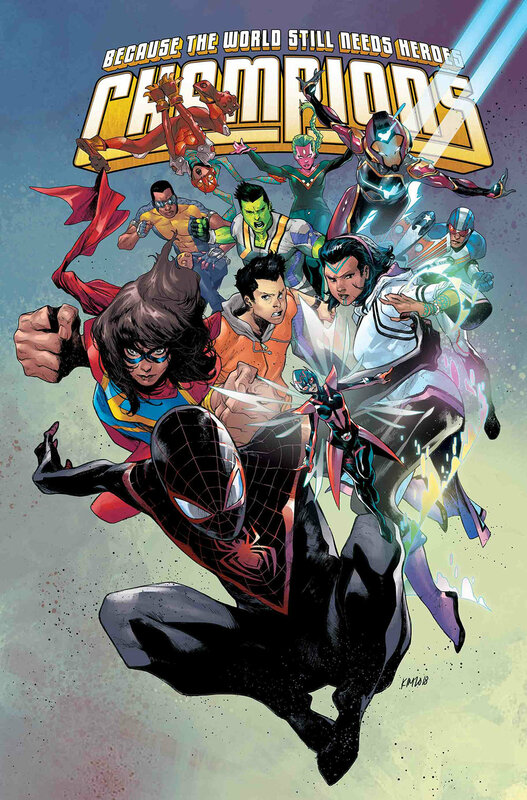 Why It’s Cool: At this time last year, the vast majority of comic book fandom didn’t even know which DC characters long-time Marvel writer Brian Michael Bendis would be taking over when he made the jump to DC. 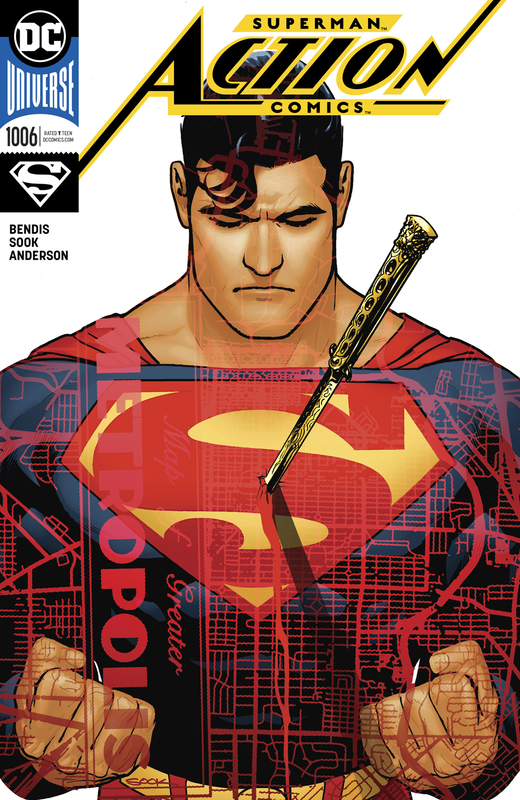 Fast forward to now, and it’s almost hard to remember that Bendis didn’t spend all of last year writing Superman stories. His work on the character has been (in my personal opinion) fantastic, and leading the way is the Daily Planet-heavy story taking place in Action Comics. It continues to build this week with an expanded look into corners of Metropolis that have rarely been seen, setting as it does some track for more major happenings later on in the year. Also, competition is fierce, but of all the top-tier artists Bendis has collaborated with since coming over to DC, I do believe that Ryan Sook is my favorite. This may be his last issue of Action Comics for the foreseeable future, but later this year he and Bendis will be collaborating on something larger, which is definitely something to keep an eye on. Oh, and speaking of last year: can you believe some yutz suggested Bendis was taking over Green Arrow? Absurd! From an age undreamed...hither came Conan the Cimmerian, black-haired, sullen-eyed, sword in hand, a thief, a reaver, a slayer, with gigantic melancholies and gigantic mirth, to tread the jeweled thrones of the Earth under his sandaled feet...Robert E. Howard's creation returns to comics, in an epic tale as only MARVEL could bring you! Conan's travels have brought him to the far reaches of the unkown, from his birthplace in Cimmeria to the kingdom of Aquilonia and all in between. As his fighting prowess allows him to carve his way through life, so too does it attract the forces of death! The all-new ages-spanning saga begins here, by writer Jason Aaron (THE MIGHTY THOR, STAR WARS) and artist Mahmud Asrar (UNCANNY X-MEN, ALL-NEW, ALL-DIFFERENT AVENGERS), as Conan's destiny is forever changed! Why It’s Cool: Jason Aaron has done absolutely incredible things with the Thor franchise, crafting what is currently the best years-long superhero run in all of comics. He just has a knack for the epic, nigh-biblical brutality inherent to norse mythology. And what, if any, comic book franchise just so happens to feel like a close cousin to norse mythology? That’s right, Conan the Barbarian. Aaron takes the keys of that book with Conan the Barbarian #1, the first in a trio of new Conan comics from Marvel, who snagged the rights for the character last year. As Thor starts to wind down with this year’s War of the Realms event, Aaron looks to start another all-time great stretch of comic book writing right here with this one. Trapped with the psychopathic streaming superstar Trotter on one side and all of Los Angeles carrying a weapon and a two-million-dollar-dream on the other, Charlie and Vita have only each other-and a few of the secrets they've been keeping from each other-to rely on for their survival. Why It’s Cool: There is no shortage of stories in comics right now that envision terrifying futures. Hell, there’s no shortage of stories in comics right now that envision terrifying near futures. That said, Crowded has distinguished itself as one of the best, doing so with a mixture of big ideas and seasoned pacing moves from one of the best writers of creator-owned comics in the industry today: Christopher Sebela. Of the many excellent new Image Comics launched in 2018 (more on that next week...stay tuned! ), this is one of the best. "HULK IN HELL" PART ONE! ...and so is the IMMORTAL HULK. Why It’s Cool: As you may or may not find out in this week’s forthcoming Best Comics of 2018, our committee of one absolutely loved Immortal Hulk last year, finding it to be a comic that both spoke to the essence of a classic character while pushing this franchise into novel new territories. This book, in other words, could do no wrong, and because of this, we’re very much excited to see where it’s all headed in the New Year. Based on preview text, that place is clearly hell, which, awesome. Can Rick Grimes bring peace to the Commonwealth-or will he tear it apart? Why It’s Cool: Although the jury is still out on whether it’s working, Robert Kirkman and Charlie Adlard are clearly trying to sophisticate and evolve the central metaphor at the heart of their long-running Walking Dead comic, perhaps to avoid the ironically slow death that seems to be afflicting the television show (what with the lead actor begging out, and everything). 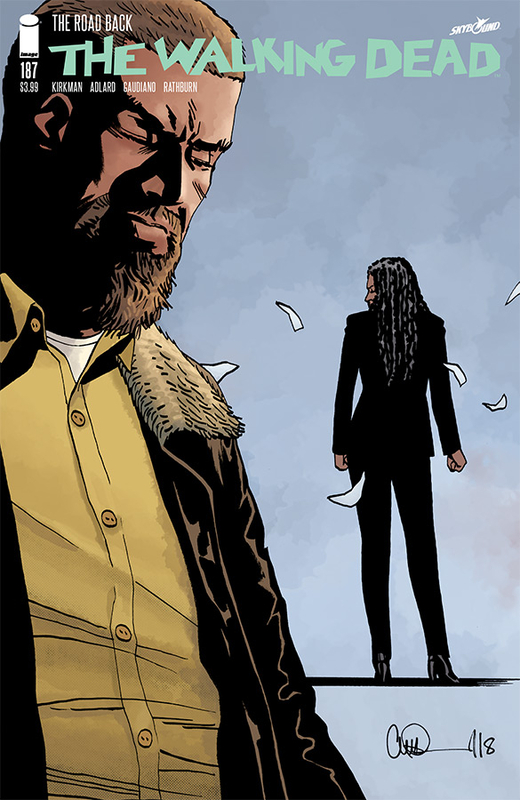 It remains to be seen, of course, whether they stick the landing, but the emotional heart of this current plotline is Michonne, and it’s pretty well-done, so much so I find the book engaging in a way it hasn’t felt since before Negan got put in that cage. There’s a weird metaphor at work here too, wherein the governor of the town where everyone is content and cared for, yet class discrepancy runs wild, looks a whole lot like Hillary Clinton, which has the lasting effect of reminding us of simpler times with more understated political problems. Kirkman et. al clearly thought like most of us that she would win and are left holding the bag...if only they could bring back Negan, who, let’s face it, is basically Trump.